Nutritional Triglyceride Reduction | Getting Well Testimonials - Full of Health Inc.
At Full of Health, we don't expect you to judge the efficacy of the nutritional triglyceride reduction only on anecdotal reports. First, it is very difficult to verify the accuracy of these accounts. Second, you cannot generalize one person's experience to others. However, we believe that all information is valuable when placed in a proper perspective. Although not a substitute for "valid science," personal experiences should be taken into consideration, especially as a means of communicating how some people get well. "I Will Take the TGs Formula for the Rest of My Life !" I just want you to know that after being on the TGs Formula at the minimum dosage [2 tablets per day] because of my busy working hours, I had a physical last week and got my lab report back. And in about two months my triglycerides dropped from 472 [mg/dL, or 5.4 mmol/L] to 284 [mg/dL, or 3.2 mmol/L]. I am so excited and overjoyed. And I thank you so much! Now, I am thrilled and just so grateful to you. I am so impressed with your website, trying to watch the diet and do my Y-Dan, and continue taking your Formula. Thank you for all of your suggestions per our phone call this morning. My husband has successfully reduced his triglycerides and has lost over 12 pounds in approximately one month by taking your TGs Formula and following a strict diet regimen as suggested in your “Bring Your Triglycerides Down Naturally” book. We are committed to improving our health by changing our lifestyle and eating habits that will lower our risk of heart disease, stroke and other degenerative diseases. Diabetes and other illnesses are on the rise unfortunately, because of the fast food choices available and the fact that many people simply do not want to take the time to eat properly and change their habits. Statin drugs or cholesterol-lowering drugs impose dangerous long term health risks that can be avoided by adopting a more holistic approach to overall health and using natural supplementation instead. In one month using your supplement in combination with dietary changes we have seen dramatic improvements and significant changes in lab tests. Our family doctor is very impressed with the results. Thank you for helping us stay on track to better health and for all the information that you are providing on your website. We greatly appreciate all your support and value the information in your books, especially the recipe book which is outstanding! This message is to express my outstanding delight with your product TGs Formula. My triglycerides were reduced from 489 to 130 [mg/dL] in four months. I cannot be more pleased. In fact, I also tried other medicines, which I could not take because of the horrible side effects. Your product is a life-saver. I’m going to recommend it to my brother who was diagnosed with pancreatitis. Please feel free to forward this message to any doubters. If anyone wants to , I will be happy to respond. Mike W.: A 12-Month Update! Almost 12 months on your diet now and I thought I should give an update on my continued success. I try to drink at least 3 quarts of water every day. Suffice it to say I am continuing with your diet. On July 1, 2005, my triglycerides were at 190 (they had been as high as 300), my LDL Cholesterol was about 150, my HDL Cholesterol was 39 and my Cholesterol ratio was about 5:1. Blood pressure was 118/80 75 pulse (Total Cholesterol is unknown). I have lost down from 210 lbs to 186 lbs (5'-10" medium build). My goal is 175 lbs. Thanks for your site which I discovered after my blood test showed my triglycerides at 902 [mg/dL or 10.3 mg/dL]! I did exactly what you advised: no alcohol at all and almost no sugar. I started on 9.6.05 and had blood test on 10.14.05. My triglycerides went down to 164 [mg/dL or 1.9 mmol/L]!!! (Also my total cholesterol went from 235 to 204). My doctor, who immediately after learning that my triglycerides where 902 prescribed me drugs which I did not take, was absolutely amazed and called me to find out how I managed to do this. He said, that he shared my experience with his colleges, and they all where amazed and asked him to find out more how I did it. So, again, THANK YOU. You, definitely, saved me from having a stroke or heart attack. I was feeling very bad for the last few years. Now, I feel better than in a long time. My headaches are almost completely gone, my constant stomach pain improved a lot, and I sleep much better. I’ve been reading and re-reading your website information on diet and triglycerides. About a couple of weeks ago, I stopped using alcohol and reduced sugar in my diet. I feel different! Food tastes better and each item has a unique taste. That must have been hidden under the familiar sugary flavor. On 5/25/05, my readings were: cholesterol – 225 [mg/dL], HDL – 41 [mg/dL], LDL – 122 [mg/dL] and triglycerides – 310 [mg/dL]. My doctor is a “statin” man. I don’t want to go that route again with little of triglycerides reduction and lots of muscle and neck stiffness instead. I can hardly wait for the next lab test to re-check my lipid levels. Please stand by for the happy news then. Thank you! I am a 35 years old male, 5’9 and 157 lbs. currently. Over a year ago, after taking annual physical exam my triglycerides were at 375 [mg/dL] and my cholesterol level was at 220 [mg/dL]. I weighted 188 lbs. Eminently, my physician recommended cholesterol-reducing drugs to bring triglycerides level down. At that point of time, I’ve opted not to get on any drugs. After extensive internet research on triglycerides and any food supplements, which can help in reducing triglycerides, I found ReduceTriglycerides.com and ended up ordering Triglyceride Reduction TGs Formula. I was amazed by the amount and depth of information provided by this website on triglycerides and the ways to reduce them. I told my physician that I need a few months and after that I’m going to repeat my physical. After four months of strict diet, working out and, most importantly, taking three bottles of the Triglyceride Reduction TGs Formula, I went back for my follow-up physical. The first thing that struck my physician was my weight - 150 lbs. Second thing - was my triglycerides and cholesterol level – 75 [mg/dL] and 200 [mg/dL] respectively. My doctor couldn’t believe when I told her this was just with natural supplements and no drugs. I’m a changed man. I’ve changed my lifestyle in terms what I eat and how much I eat. I also workout regularly at least 3-4 times a week. The guidelines on this website were very clear and easy to follow, not to mention the information on Triglyceride Reduction TGs Formula. After taking 1 bottle [of Triglyceride Reduction TGs Formula] over about 6-7 weeks and watching my diet closely, my results today were 194 on my cholesterol but my tri’s were 105!!! * The testimonial above has been presented as a true story. However, it has not been reviewed by Full of Health, Inc. and is the opinion of the listed individual. After taking the TGs Formula for 1 month - 3 per day, my cholesterol count is down by almost 100. It went from 288 to 194; the triglycerides came down 30 points. I am amazed; my doctor was happy and very puzzled because I had not lost any weight. I told him about the supplement, but he didn't have any comment one way or the other. Me, I'm very pleased with the results! My triglycerides were 748 [mg/dL] and I started taking Triglyceride Reduction TGs Formula. A quadruple by-pass, 3 heart attacks (2 massive), 3 congestive heart failures, my heart functioning at 25% and 16 medications a day is my background. With my high triglyceride count the dosage suggested is 4 tablets a day. For 2 1/2 months, due to all my problems, I only took 2 a day. When my lipid panel was checked my triglyceride count had dropped to 423. I now know Triglyceride Reduction TGs Formula can be combined with my medication, does not upset my stomach and above all, it WORKS. Today, I received my second order and will be taking as directed and have no doubt my count will be acceptable. "I'm Astonished by the Results!" "His Doctor Was Elated and Amazed"
My husband was told on May 4, 2006 that his bloodwork showed his total cholesterol was 261 and that his triglycerides were 336. His doctor told him that he wanted to retest in 3 months and that if the numbers weren't greatly improved he would want to put him on statins. That's when I went looking for a better way. I found your product [Triglyceride Reduction Formula] online and placed an order. My husband began taking your recommended dose as soon as the pills arrived. He just had his bloodwork retested on August 23, 2006 and his total cholesterol is now 168 with his triglycerides now 131. His doctor was elated and amazed and no longer talks of statins. My husband is having another follow-up blood test in 6 months so he is staying on a maintenance dose of one pill in the morning and one pill in the evening until then. We both cannot thank you enough for your wonderful product. Please feel free to use my testimonial on your website (always keeping my privacy & confidentiality protected). And thank you again for your wonderful product! "The Formula Made a Difference"
This time, my wife who is also a naturopath, suggested the Triglyceride Reduction Formula. But she told me to do the bloodwork first. This site has saved my life! I found out on Halloween 2005 that my triglicerides were at 601 and my cholesterol was at 229. *This testimonial has been presented as a true story. However, it has not been reviewed and is the sole opinion of the listed individual. "There Was No Diet For My Needs!" I had a problem with high triglycerides: 570 last April, brought them down to 240 by August. My doctor said, that's not good enough, we will have to go on medication. I then asked him what I needed to do instead of medication. He informed me, that I would have to drop 20 pounds at least. This was mid October 2002. There was no diet for my needs. I went on the internet and found your nutritional triglyceride reduction article. I printed it and read it several times and kept with it and the suggestions that you gave. On Jan. 8/03 I had my blood work. My Dr. called me on the phone and asked what had happened everything was down well in the normal range. HDL was the only one at the bottom end at 39 and should have been somewhere in the high 40's, but he felt that given a little more time it would also be okay. Triglycerides dropped to 108 which was fantastic. I'm now at 188 and hope to drop another 10 pounds. Blood pressure has dropped to lower numbers but not enough yet to cut back on medication. Thank you for this study and its suggestions. I have been on your Triglyceride Reduction Formula for 2 months. I just had my first blood work done and would like for you to know the results. I have followed the diet closely. Have not viewed the [Y-Dan exercise] video yet, so my results are very impressive. I took Zocor and Lipitor a year ago and had to stop taking them because they made me feel terrible (body aches and pain). Someone told me the other day I look so much healthier. My nails grow so fast and so long they get in my way. My thin hair is much healthier. I have had no side effects from the Formula. I have upper G.I. problems, but have not had any trouble. I feel much better, have more energy and am more interested in things than I have been in several years. I am 65 years old and had slipped into that listless, apathetic, just waiting for the inevitable state of mind. I work full time in a trauma center, which requires good mental acuity. I have always had that, but it seems to be sharper. On 5/2/02, my cholesterol was 309. Today [8/14/04], it was 231. On 5/2/02, my triglycerides were 547. Today [8/14/04], they were 301. My HDL, VLDL, and LDL [cholesterol] are stabilizing as well. I haven’t been this good in 20 years! (I have familial high cholesterol and triglycerides, so I have had the problem for 20 years.) So, now that I know the Formula works, I will recommend it to everybody. This is absolutely an unsolicited testimonial. I have worked in medicine all of my adult life and consequently know the difference. P.S. I would also like to add that I have lost 12 pounds. This is truly amazing! We will definitely stay with your diet and the Formula. "Favorable Results from the Formula"
You will recall that my heart problem was a high (and considerably dangerous) level of Lipoprotein (a). Then I began the Formula, and after 3 ½ months the Lp (a) dropped to 18, which is now below the Berkeley HeartLab: good < 20. * The testimonial above has been reviewed by Full of Health, Inc.
At ReduceTriglycerides.com, we need your opinion. We admit that we are not perfect; in fact, we are far from it. That's why we need your help to improve this website. We want to hear what you think of us, because after all, ReduceTriglycerides.com is a website for all people who need - and expect - quality information. Let us know what you think of our content. What do you think we need to improve on? And what topics would you like to see covered? Please don’t hesitate to voice your concerns. If you think ReduceTriglycerides.com isn't doing an accurate job or is just pushing its own supplements, we want to hear about it. Everybody is welcome to contact us. We appreciate all opinions. 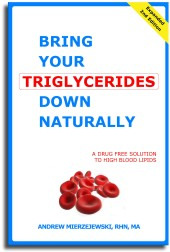 © 2001-2010 Reduce Triglycerides.com: Loweing High Triglycerides Naturally. Triglyceride Reduction TGs Formula - A Drug-Free Approach to Elevated Blood Triglycerides. All rights reserved worldwide. This document may not be copied in part or full without express written permission from the publisher. The information on high triglycerides and nutrition provided herein is a general overview on this topic and may not apply to everyone, therefore, it should not be used for diagnosis or treatment of any medical condition. While reasonable effort has been made to ensure the accuracy of the information on reducing elevated triglycerides, Full of Health, Inc. assumes no responsibility for errors or omissions, or for damages resulting from use of the high triglyceride information herein.